You'll find yourself back in Pallet Town, but there is no time to relax. Professor Oak will approach you and he'll immediately analyze your Pokedex. If you have owned at least 60 Pokemon, he'll lead you inside his lab, and tell you that there have been sightings of totally new Pokemon species. Blue will then join you. The Professor will then take both Pokedexes and upgrade them to National Pokedex status, allowing you to register even more kinds of Pokemon! Time to head back to the Sevii Islands, and continue your quest to become the greatest trainer of all! Depart from Vermillion City, head to One Island and talk to Celio, Bill's friend on One Island. Celio asks you to help him find a gem that will make his Pokémon trading machine work. The Ruby is at Mt. Ember, but you may want to check some things before continuing this quest. Now that you've defeated the Elite Four, some things have changed in the Sevii Islands. Two Island's market will update to contain even more inventory, so check that out. Three Island has also changed somewhat. As you leave the ferry, you'll find yourself at the Port. Enter the cave and discover that the man inside has completed his excavation, and will gift you a Nugget! The cave itself also has a hidden Nugget as well. 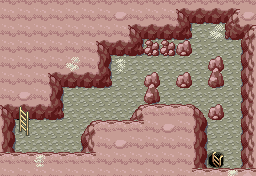 Exit the cave from the other side, and walking the grass will grant you the chance to catch a new Johto Pokemon! Beating the Elite Four will give you access to many rare and exciting Pokemon. Dunsparce... is not one of them. A Normal Pokemon, aside from its HP its stats are quite mediocre. With moves such as Take Down, Rage and Flail, Dunsparce's moves appear orientated to take advantage of its HP. Dunsparce is also able to learn a great number of TM's, but as its Spc. Atk. is so low, it would just be a waste of a TM to improve it. Dunsparce may be a new Pokemon, but its place is inside your PC, not in your team. From One Island, head north towards Mt. Ember. This time, confront the two Team Rocket members. 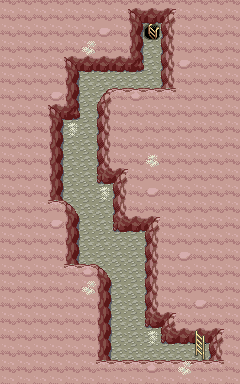 You'll find them talking to each other about the first of two secret passwords ("Goldeen need log"), standing in front of a newly excavated cave entrance. Battle both of them and they'll leave after being defeated. 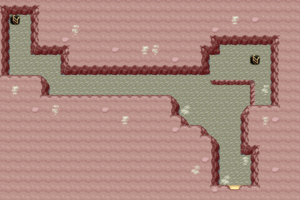 Go inside the cave and follow the path, but remember to bring a Pokemon that knows Strength. This section is self-explanatory. Just follow the road north to the stairs. There's not any new Pokemon just yet. Again, self explanatory, but at least there is a new Pokemon to catch in this room! You'll need to push some boulders here. It's a simple puzzle, but if you mess up, just go back to reset it. After bypassing an initial boulder, you'll find that you need to make a choice where to go. Head south and then west to B4F and continue in your quest for the Ruby. 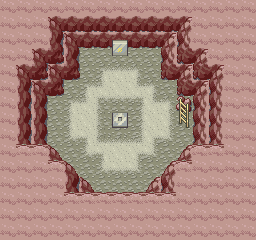 Later you can come back to this floor and head the other way (the east route) to find a quick path to exit Mt. Ember. If you brought a Pokemon that knows Rock Smash, you just might get another new Pokemon! There are walls covered with Braille text in this room, but they bear no message. It is only the alphabet in Braille so pay no attention to it and head down. 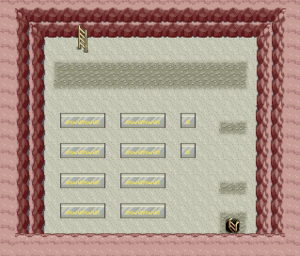 Finally, you have located the Ruby Celio requested, which is located in the center of this room. This room's north wall is also full of Braille messages, but it's only flavor text. If you are interested, the Braille message says "Everything has meaning. Existence has meaning. Being alive has meaning. Have dreams. Use power." Leave Mt. Ember with the aid of an Escape Rope or by going back to Floor B3 and heading south and east. Go back to Celio and hand him the Ruby. Celio now wants you to go on another mission and seek the Sapphire, the twin gem to the one that you just delivered. Celio will then hand you his Rainbow Pass, which gives you access to the rest of the Sevii Islands. Now take the ferry to unexplored territory: Four Island!. Slugma does not seem much at first, being a Fire Pokemon with really bad stats. However, once it evolves into Magcargo at Level 38, it becomes a Fire/Rock Pokemon, an unusual combination. Once evolved, Magcargo's defense stats heavily increase, along with its special stats. Its moveset also supports its natures quite well, Flamethrower and Rock Slide being its strongest moves. Unfortunately, its HP, attack and speed are quite low, making Magcargo quite unbalanced and thus, a gamble to include in your team. This page was last edited on 2 September 2017, at 17:17. This page has been accessed 83,311 times.